Dan Haesler: Okay, now what? Nothing has promised so much yet returned so little. Why is it so difficult to implement change? 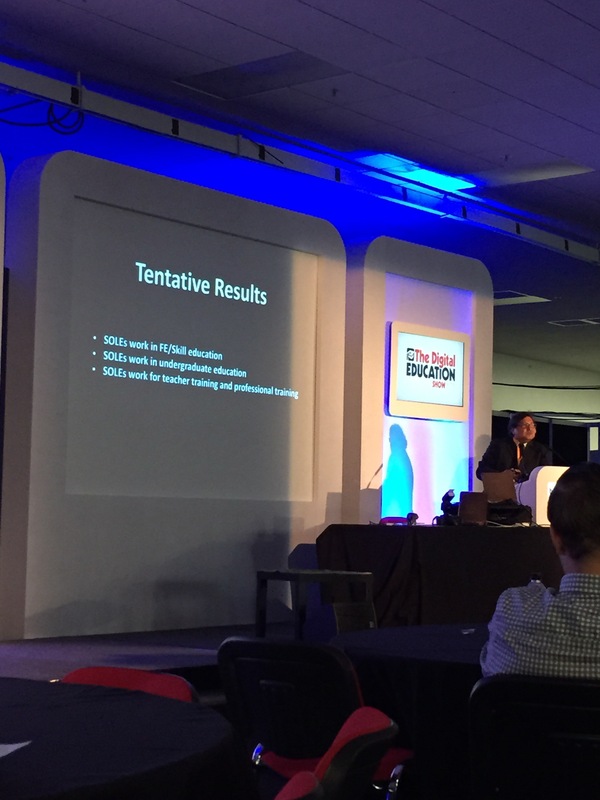 How can we take what we have learnt at this conference back to school? Transtheoretical model of change Blissfully unaware, Thinking, Preparing, Acting, Maintaining. We often ask people to change who haven’t even thought about changing. People at school are blissfully unaware of what is happening in the heads of people at conferences like this. Chessboard illusion. Throughout this journey of implementing change setbacks are inevitable. This is OK. Success is not a neat, linear progression. Achieving success is messy! The thinking stage is important. It is where the analysis needs to take place and ideas need to be contextualised and evaluated. Engagement What do we mean? Often, Dan explores, we mean compliant. Through discussing the continuum of engagement, Dan discusses differences between pupils in learning environments. Changing the language of engagement can be an important way to reframe what it means. Moving from ‘on task’ to ‘in task’ can change the definition. We are educating our children into unemployment. Again, the issue of future employment and future jobs reappeared in conversation. Why not continue to track pupils after they leave our schools? Do our pupils enjoy lifelong learning? Do they find success after school? Interesting questions raised with regards to how we judge ‘successful’ schools. Purpose You must have a purpose driving changes you want to make. As Ewan McIntosh said yesterday, find the right problems. Ideas must be contextually specific. Dan used an example from work he carried out working with Australian aboriginal children. Autonomy Let the children design solutions to problems themselves. Empower and enfranchise them to become part of the changes being made. Mastery ‘Not Yet’ and the power of growth mindset. Don’t put limits on children and what they can achieve. Why is it that children fail over and over again in computer games and return to it but fail once or twice in maths and give up? 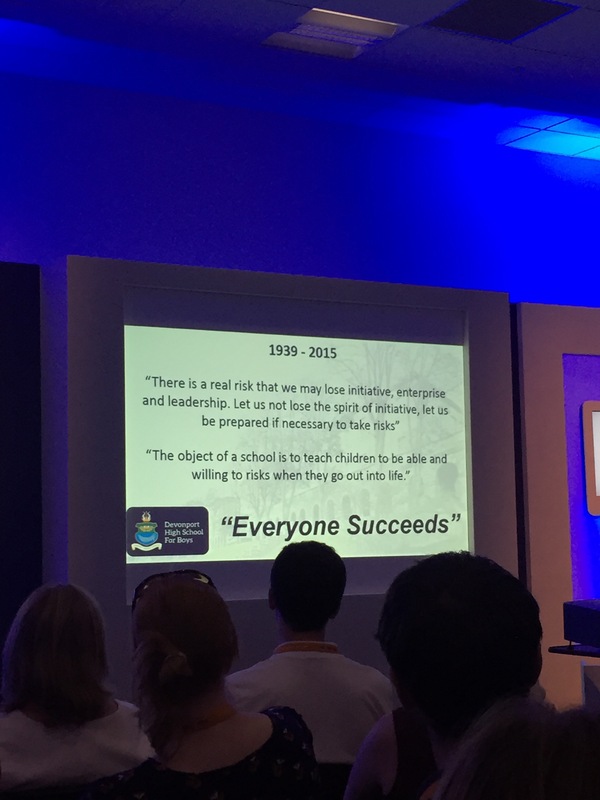 Poignantly, Dan explored how, ‘The context of a set back is the same regardless of context.’ It’s the rhetoric around failure in schools that impacts how children perceive failure in learning. When are you or your colleagues most in task? When they have a clear defined purpose, when they have autonomy and when they are trusted. ‘We judge ourselves by our intentions, and others by their behaviour.’ Steven Covey. The Digital Skills Gap Is it a problem? It’s definitely a problem from the industry side of things. Richard Gerver said yesterday, ‘Programmers are 10 a penny’. However, this is not the case. Lots of businesses do struggle to find high quality programmers. The danger of code academy and the focus on coding in schools is that people learn coding skills in a specific, walled environment (classroom, online learning course). However, in the work place these skills can become lost in transference. Pupils will need opportunities to apply their skills and understand the real world application of these skills in industry. STEM, STEAM, STEAMED…whatever the term, whatever the subjects you consider to be within them, the most important part of this area is defining a problem and articulating a problem before designing a solution. Developing entrepreneurial mindsets in young people is crucial. Preparation for the digital economy Businesses who haven’t embraced entrepreneurialism and technology in their industry have disappeared. Yesterday, Sir Ken Robinson mentioned Kodak and today companies like Woolworths and HMV have been noted. Businesses of the future require employees who are digitally capable. If they don’t have the workforce to solve the problem of digital, they won’t survive. The problem with online learning is that there is no current way of formally tracking it. MindField is a potential answer to this (Spencer Ayres is developing). Pupils from disadvantaged backgrounds need to be given the opportunity to do something different and something special. Jamie Lee Brett exposed his personal educational experience and told his story of how he overcame many obstacles by solving a range of problems in his own way to find great success. This highlights how young people can become disenfranchised with their learning, which can restrict their possibilities. Future of employment The Channel 4 drama ‘Humans‘ portrays a possible future full of ‘Synths’: human looking devices that begin to take the jobs of humans. 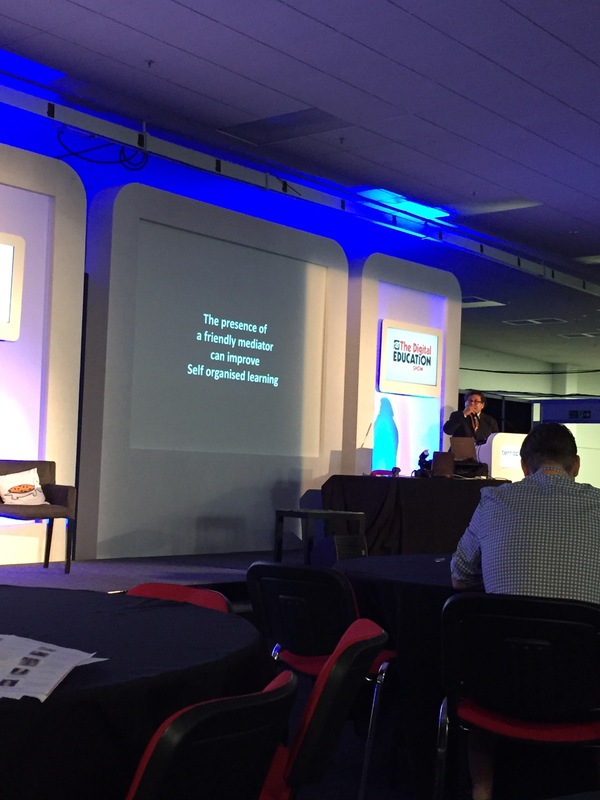 Yesterday, Sir Ken Robinson touched on the potential of future technology in becoming ‘at one’ with humans. Again, this talk highlighted the need for us to truly begin to comprehend and realise that employment in the future will look completely different. Young people need to see ‘big picture’ jobs. Barriers need to be removed such as the need to be ‘realistic’ in considering what jobs young people want. It is worrying that we can put caps on young people’s ambitions by pushing them to be more ‘realistic’ when they define what they want to be. Bloxx Ltd uses Tru-View Technology to protect students when implementing BYOD strategies. BYOD in education brings a great many benefits. 42% of children aged 5-15 use a table to go online. In 2015 Bloxx compiled a report into the impact of social media in education. To make BYOD work, pupils and staff need to create policies to ensure use is acceptable. A lot of schools are moving away from ‘acceptable use’ to ‘technology use’ policies. In some schools, pupils have to accept the policy when they open an internet browser page. Tim and Sarah shared a huge range of digital tools/websites/resources/apps all of which are available here and here. Dan began looking at the last few years in education in terms of news stories and how the purpose of education and role of teachers has been perceived. From Gove’s appointment to Morgan’s recent coasting schools announcement, the situation can be seen as quite depressing. Potentially, these are the conditions for destruction and frustration. Despite the negative aspects of this publicity, there is still reason to be optimistic. 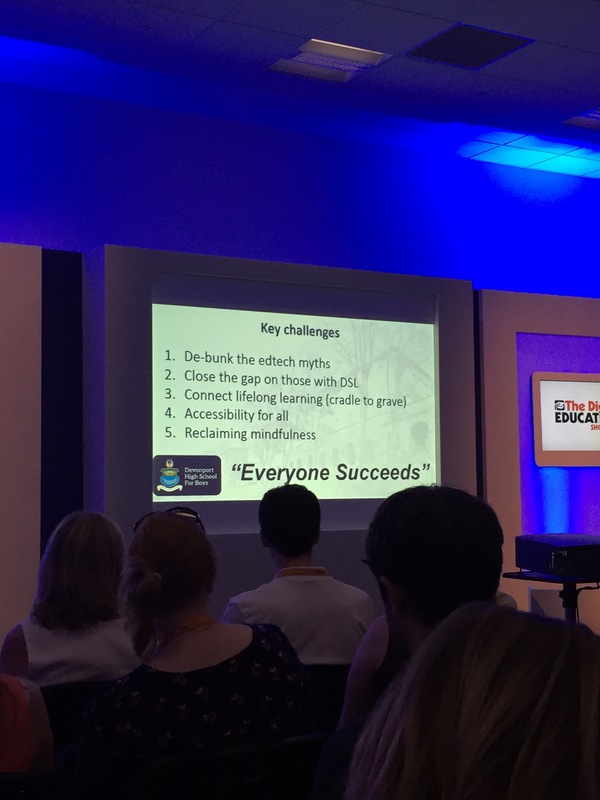 And in fact, Dan explored, there is a lot of positive practice happening and being developed in schools and education systems around the world. These times call for brave leadership. This is a really important point that particularly resonates with the messages of bottom-up disruption from Sir Ken Robinson’s talk yesterday. By leadership, it is not just head teachers that can make a difference. Leaders at all levels (teachers, subject coordinators, middle and senior leaders…everyone!) can be the driving force behind positive change. Why do you do what you do? An important question for all teachers to consider. What is the motive behind your decision? Embrace social media Parental engagement increases. As an additional benefit you raise awareness of your school in potential employees. We are facing a recruitment crisis in schools so now is the time to use this opportunity. Accessibility for all DHSB have used Pupil Premium funding to fund tech projects and develop hardware for pupils at school. These have included purchasing an iPad and supporting broadband costs. Brave teachers Teachers should be encouraged to embrace and be open to new technology. The culture and ethos of the school must support this. Collective capacity Teachers need to work together, connect and share good practice. Twitter is an excellent tool for this. A ‘Market Place’ has been developed at DHSB. Teachers pick an area of practice they want to develop and work on this area, carrying out a research project. Towards the end of the year they share the outcomes of this in the ‘Market Place’. Blogging Get pupils and staff to blog. David Mitchell (@deputymitchell) is an advocate of this and the man to speak to if you want to get started. The right tool for the job Take a Swiss Army Knife approach. The use of ICT must impact on learning. If it doesn’t, don’t use it. Social enterprise Pupils at DHSB have approached staff with digital solutions to problems or opportunities. These have been used to improve practice at the school. These include a house group display/tracking system and a flipped learning approach that supported teachers with their marking (using Flubaroo). Some amazing stuff in this area: have a look at Thinkspace (developed by pupils in Plymouth) and Space Lounge (a start up company created by an A Level student). Every teacher and every learner has a legacy. What is yours going to be? 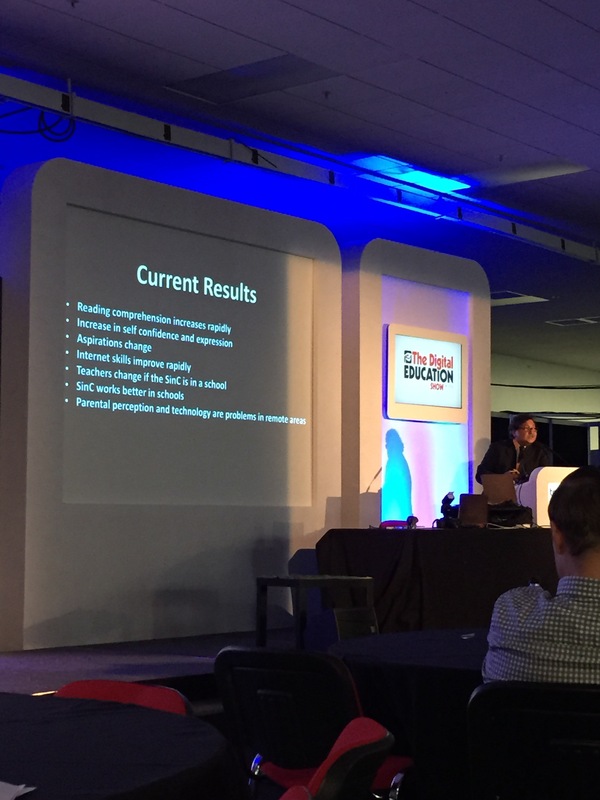 Day 2 at the Digital Education Show kicked off with Sugata Mitra. The following is a brief reflection on the thoughts shared by Mitra. The italics are my reflections. The roman is Sugata Mitra’s comments approximately paraphrased. The hole in the wall project was 16 years ago. It was an experiment designed out of curiosity with far reaching and unanticipated impacts. Under the right circumstances, children are capable of learning maths and computer science, the pronunciation of English words, and even biotechnology. All of the results of these experiments are well documented online. Mitra went on to discuss his work with the Uruguayan government who interestingly, a long time ago now, gave every pupil attending a state school a laptop. The Hole in the Wall and Gateshead experiments began to tell us about a new kind of learning process. There is nothing [Sugata] has found to prove this wrong. The Granny Cloud Sugata found that in the process of children finding out ‘stuff’ for themselves, you could, as an adult, improve the process. If you have a friendly, non-threatening adult who encourages the process of self organised learning, the process seems to produce better results. Here, the future role of ‘teacher’ is important to consider and to question. The adults on the Granny Cloud can be connected to classrooms where adults can’t or won’t normally go. Teacher migration is an issue for the Indian government. How are they going to address the problem? With teacher training. The aim is to improve the quality of the teaching in remote towns and villages where the migration issue is most problematic. However, improving teachers will just enable more to move away. Density of council housing plotted against GCSE scores in England relate to the same downward curve Sugata found in India. In India it was a geographical problem. In England it was social. The same problem appeared in a different guise. Looking in other countries, the same problem exists. There are some places in the world where good teachers cannot or will not go. These places remain there for a number of years and then you get trouble. The solution was to find a way to not use teachers in these places. Self organised learning Self organising systems is a term from maths and physics which talks about ‘chaotic’ systems. They are ‘spontaneously’ ordered. These systems are not organised! Sugata explored an example that helps him explain this to other people. The synchronous clapping experiment is an activity where you ask a group to clap at the same time and then question them in order to help them see the random organisation. Who synchronised the claps? Who decided on the frequency of the claps? Nature uses these systems all the time. So why not learning? How do you get collaboration automatically? If you restrict resources the collaboration happens. Don’t ask children to make groups as you bring in bias. Ask children a big question and allow them to group themselves. In one example of this in the classroom, one child, within 25 minutes, was presenting to the rest of the class at an undergraduate level. However, while she had prepared a script and was reading the information clearly, I would question whether or not she truly ‘understood’ the concepts in the sense that she could explain them in her own words and apply them in a range of contexts. Obviously, this would take more learning time. Mitra took us through the results of testing 8 and 9 year olds on GCSE questions. After a couple of months, the children were retested and the percentage scores increased. This is evidence that I aim to investigate further. The challenge of assessment The preindustrial, pre-machine way of running the world required people to fill it. In order to find these people, schools were created. If you were an assembly worker, what would I teach you? I would teach you to do the same thing over and over again; I would teach you not to ask questions; and I would teach you to never be creative. Children are being prepared for a world that doesn’t exist anymore. In order to prepare children for a role in this world, shouldn’t exams look different? The existing school system pretends that the internet doesn’t exist. Although I am sure that there are many schools still putting up walls with regards to access to the internet, I think this is a big claim. I think that actually there are a number of schools who have, for a number of years, been thinking more progressively that this. However, I do agree with Sugata that this should be spread widely. 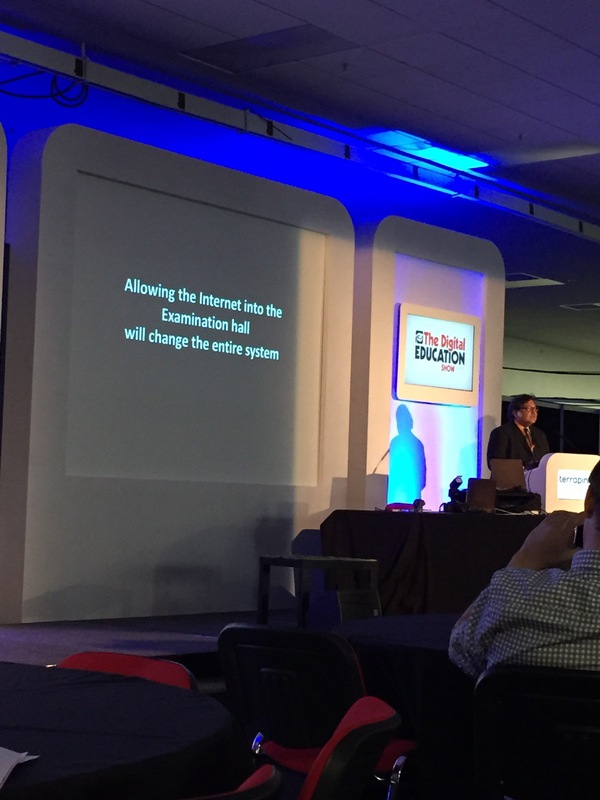 Taking us through a range of GCSE questions, Mitra posed that the internet should be allowed in examinations if they are to better reflect the world that we live in. Each question could be answered within seconds, if the internet was made available and it could be ‘Googled’. Inevitably, there are deeper philosophical issues here related to Google’s ownership and control of data. And there are issues of trust and accuracy related to websites and information. However, this is an important point that needs considering on a wider scale in education systems. School in the cloud The idea was to bring SOLE and the Granny Cloud together into different kinds of cultural and socioeconomic settings. To build seven schools in the cloud in a range of social backgrounds. Mitra took us through the current schools that he has created as part of his Schools in the Cloud project. The School In The Cloud: Trailer from Docs & Pieces on Vimeo. 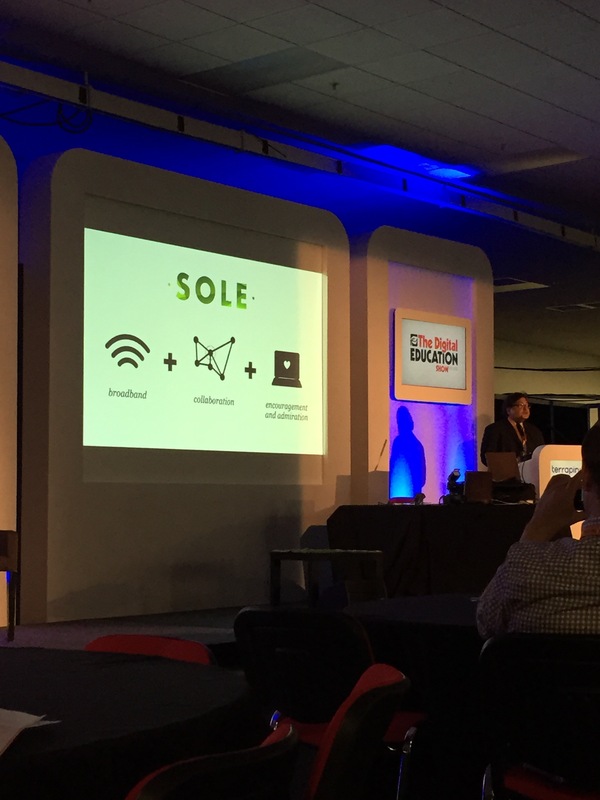 Teachers have implemented SOLEs all around the world and have been blogging about the impact. Their results are extraordinarily positive. SOLEs are out there. But they are struggling against an outdated education system. The need for change is now. The reaction of students who have been through a SOLE project as part of undergraduate studies was interesting. When completing an evaluation they said things like ‘we need more regimentation’, ‘it was awful, we had to do all the work ourselves’. The long lasting impact of our system is destructive. At the end of the talk there was a question from the audience related to filtering. If children are given access to a device with a big screen, they are less likely to purposely access inappropriate information. Sugata explained that there are a number of social ‘natural’ controls that can help to filter. If there is a firewall, a child will want to know what is behind it. 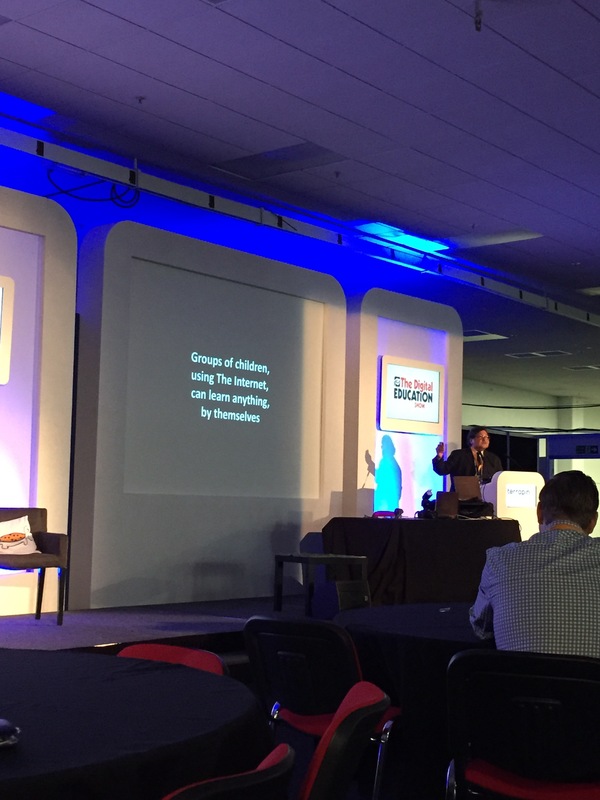 This was a fantastic, pragmatic talk and a great way to start the second day at #DigitalEducationUK. Real evidence of real outcomes of a real definition of the potential future of schools. Flipped learning allows classroom time to focus on the application of knowledge rather than the knowledge itself. Watching is more than just sitting back and pressing play. Need to model the process of watching videos you create so that children actively engage with the content. Chris disussed the visit he made to the Wroxham School which resulted in him taking back many practices to his own school. Children are not grouped by ability in any area of the curriculum. They have learning parters each week and they choose who to work with. Children self-differentiate their learning. Once they’ve watched a video online, before a lesson, they know what they need to work on. In the classroom there is a challenge system then enables children to choose and then move their learning on. Feedback from Ofsted was overwhelmingly positive with a focus on how this process has impacted learning and learning behaviour. A key part of the approach is homework, which can cause some problems. Needs to become part of regular practice and an expectation. Educanon and EdPuzzle are tools that can be used to create video or paste in links from YouTube. The tools allow you to embed questions into videos and receive feedback on the process they have been through. Lessons can be adjusted based on this data. Getting students onboard is important and it’s necessary to think about what the challenges back in class will be. How will the content of the challenges engage pupils? What about those without Internet access? Open up the classroom early, leave out iPads with the video running, give pupils time during the day. How can I engage parents? Tell them what children are learning, promote the videos, use social media, use the school website. Enhance the process by empowering children to create videos themselves. This is a really powerful way to assess children and identify misconceptions when calculating. Model the process of taking notes and writing down questions, etc. The impact of this is that it enables more time in the classroom to be spent on questioning and developing understanding through problem solving activities. Children’s independence increases and parents are able to build on pupils’ learning in class.